We are very proud to have hosted hundreds of successful shows over our history at the Edinburgh Fringe. We wanted to share two of them with you to highlight what can be achieved from the smallest of casts to a large popular rock musical! Mrs Shakespeare is a one woman comedy written and directed by Ian Wild starring Irene Kelleher. The story follows William Shakespeare, reincarnated as a woman, who finds herself in a mental asylum and realises that she has made a complete mess of writing ‘Hamlet’ 400 years earlier. This show was one of our three week runs at the 2015 festival, performed at 11:50 each day in our 40 seat Annexe space and had an average audience size of 30 people. 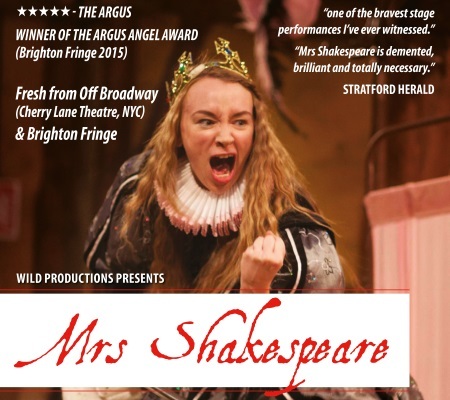 Mrs Shakespeare had already been performed to critical acclaim before the Fringe, earning a 5 star review at the Brighton Fringe. We helped this show to build on its previous success by including it in our Venue Press Release, sent to over a hundred organisations likely to be covering the festival. We also made sure that Irene’s success was publicised on our social media pages which are active throughout the year. Because Mrs Shakespeare had been performed elsewhere, it already had its own press and marketing materials, including poster (see above). We helped to adapt these materials for our venue and, as with all our shows, displayed them in front of house areas for nearly 20,000 visitors to see. RENT tells a story of hardship, loss and the love that makes life worth living and it was that powerful story which New York based company Uncompromising Artistry Productions brought to life in their inaugural season. RENT is a large cast, high energy rock musical which stole the hearts of audiences and our venue staff alike. RENT was performed at 18:00 each day of the three week festival, with an average audience size of 95 in the 110 seat Sanctuary space. With such an ambitious show, the company were keen to ensure that we were capable of delivering their exact technical requirements and talked to us throughout the process from their initial application until the end of their run. Because the show needed 15 actors with radio mics, we decided to improve our standard technical specifications and hire a larger sound desk at no additional cost to the company. We also worked with our technical suppliers to get a competitive quote for radio mics, in the end our supplier purchased brand new microphones specifically for the production. RENT was one of a number of shows coming to us from the USA and when the company arrived we helped them to source their set. We were also able to lend some spare volunteers with woodwork skills to build their workbenches and help get the first curtain up on time! All of our festival staff are all unpaid volunteers with a passion for theatre and a love of the fringe. We're here to work with you to make your fringe show as successful as possible. "I can't say enough good things about everyone's attitude at Paradise Green just a great group." "Great location, fantastic staff. Can we come back next year?" "Friendly fun venue with a track record! You helped make our fringe debut a great success!" "Provided an excellent venue at a fair price and provided a cheerful and friendly environment to perform in." "I partly based my decision to do the show at Paradise Green on the excellence of the pre-show communication and how promptly and clearly you replied to my questions and concerns." "I was delighted that I had stumbled into doing my show at Paradise Green The location was brilliant, you were completely fair and honest about the contracts and the pay outs, any problems with the theatres were addressed immediately, and finally the cheerful and delighted attitude of the staff and crew made turning up for a performance a pleasure." "Everything is always exactly as described. There was flexibility and we were able to 'feel at home' in the venue"